Please don’t put mailcatcher into your Gemfile. It will conflict with your applications gems at some point. If you’ve installed via RVM this probably won’t work unless you’ve manually added your RVM bin paths to your system environment’s PATH. In that case, run which catchmail and put that path into the sendmail_path directive above instead of /usr/bin/env catchmail. A fairly RESTful URL schema means you can download a list of messages in JSON from /messages, each message’s metadata with /messages/:id.json, and then the pertinent parts with /messages/:id.html and /messages/:id.plain for the default HTML and plain text version, /messages/:id/:cid for individual attachments by CID, or the whole message with /messages/:id.source. Mail processing is fairly basic but easily modified. If something doesn’t work for you, fork and fix it or file an issue and let me know. Include the whole message you’re having problems with. Compatibility testing against CampaignMonitor’s design guidelines and CSS support matrix. 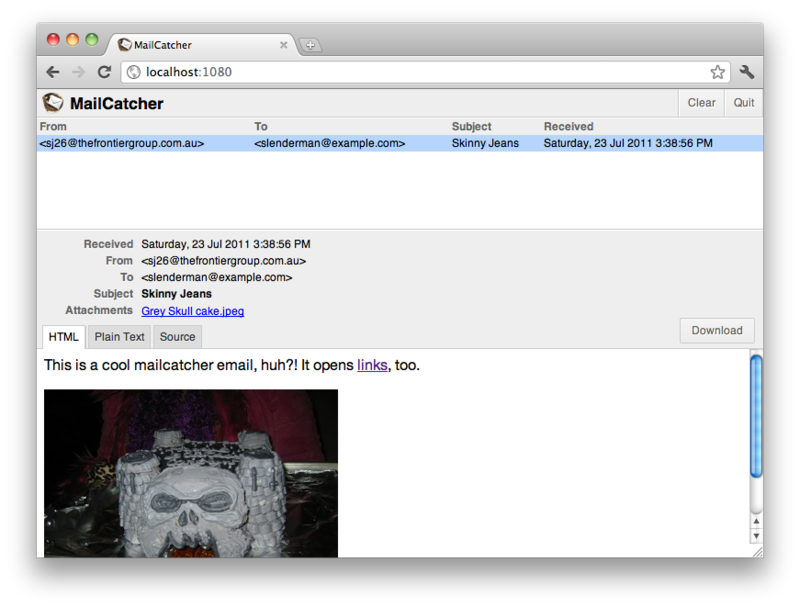 MailCatcher is just a mishmash of other people’s hard work. Thank you so much to the people who have built the wonderful guts on which this project relies. I work on MailCatcher mostly in my own spare time. If you’ve found Mailcatcher useful and would like to help feed me and fund continued development and new features, please donate via PayPal. If you’d like a specific feature added to MailCatcher and are willing to pay for it, please email me.